● Tim Hunter is deputy editor, Auckland Business Bureau at Fairfax Media. 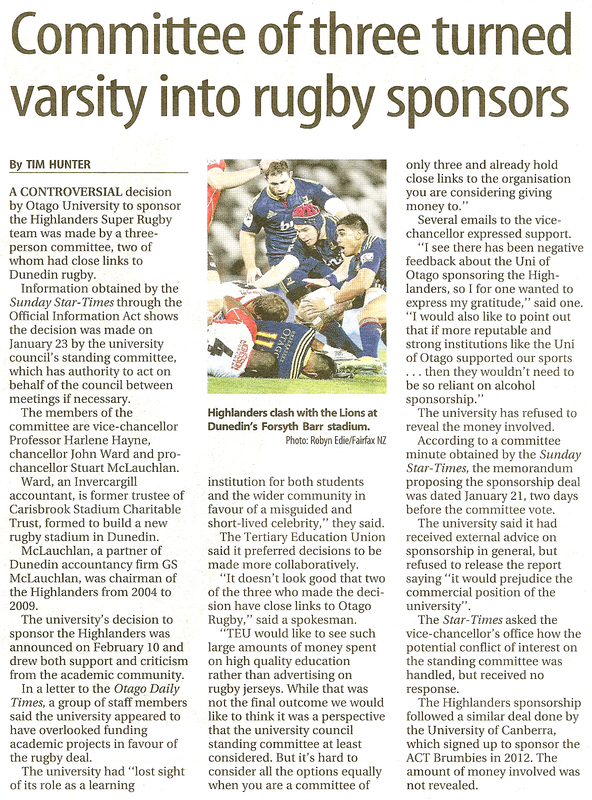 11.12.13 Highlanders “Buy Us” entertainment: Obnoxious, noxious PROFESSIONAL RUGBY —stay away DCC !!! Last year, the residents randomly selected from the electoral roll were invited to complete the ROS online using a unique code, rather than receiving a hard copy of the questionnaire. A hard copy was made available on request. This was successful in raising the response rate and cutting costs so the same approach is being taken this year. The survey is also open to all residents online at www.dunedin.govt.nz/ros and will be sent to all members of the Dunedin Peoples’ Panel. To ensure the statistical validity of the ROS results, the responses from the people who were selected are used as the official results. █ The Survey is open until 18 June. A reminder letter and hard copy of the questionnaire will be sent to those who haven’t responded about two weeks after the initial letter, a practice that has proved successful in increasing the response rate. The results are expected to be publicly available in late July. █ Responses from residents who independently chose to complete the Survey online are analysed separately but still provide the DCC with valuable feedback about how it can improve its services. Contact DCC Acting General Manager Services and Development on 03 477 4000. 9.9.13 Residents’ dissatisfaction (2013) with elected council and mayor —increase!